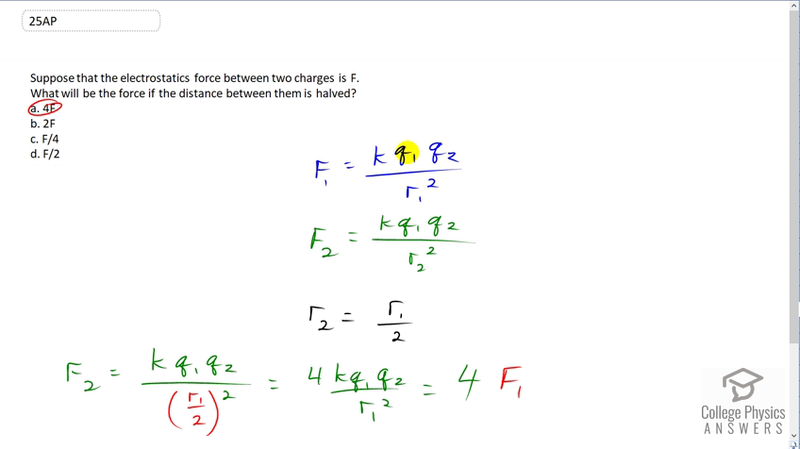 For questions 25–27, suppose that the electrostatics force between two charges is F. What will be the force if the distance between them is halved? This is College Physics Answers with Shaun Dychko. We have two charges and the force between them is F. Now in the first scenario, we have F one is Coulomb's constant times the product of the two charges divided by the original distance between them squared. Then in the second scenario we have the same numerator but we have r two squared. We're told that r two is half of r one. So the distance between them is halved. Then we replace r one over two in place of r two in this force two formula, and this makes r one over two all squared, and this denominator here will become four and we multiply top and bottom by four to get rid of the four that's in the denominator of the denominator, which is a bit confusing. So put it in the numerator and we end up with four times k Q one Q two over r one squared and this is F one. So F two is four times F one. So that's why the answer is A.